Sandi's Rec: One summer in the life of 10 year old Helen as she deals with the death of her beloved caretaker + grandmother, the absence of her father and first love. Set at the end of WWII, this is a haunting coming of age story. Ten-year-old Helen and her summer guardian, Flora, are isolated together in Helen's decaying family house while her father is doing secret war work in Oak Ridge during the final months of World War II. At three, Helen lost her mother, and the beloved grandmother who raised her has just died. A fiercely imaginative child, Helen is desperate to keep her house intact with all its ghosts and stories. Flora, her late mother's twenty-two-year-old first cousin, who cries at the drop of a hat, is ardently determined to do her best for Helen. Their relationship and its fallout, played against a backdrop of a lost America, will haunt Helen for the rest of her life. This darkly beautiful novel about a child and a caretaker in isolation evokes shades of The Turn of the Screw and also harks back to Godwin's memorable novel of growing up The Finishing School. 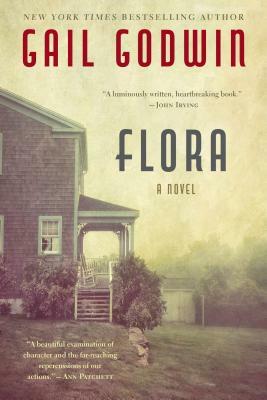 With a house on top of a mountain and a child who may be a bomb that will one day go off, Flora tells a story of love, regret, and the things we can't undo. Gail Godwin is a three-time National Book Award finalist and the bestselling author of twelve critically acclaimed novels, including Violet Clay, Father Melancholy's Daughter, Evensong, The Good Husband and Evenings at Five. She is also the author of The Making of a Writer, her journal in two volumes (ed. Rob Neufeld). She has received a Guggenheim Fellowship, National Endowment for the Arts grants for both fiction and libretto writing, and the Award in Literature from the American Academy of Arts and Letters. Gail Godwin lives in Woodstock, New York.